Stormwater, as defined by Clean Water Act regulations, is “stormwater runoff, snow melt runoff, and surface runoff and drainage,” or precipitation that runs off streets, lawns and other land surfaces. Stormwater runoff is considered a nonpoint source pollutant because it comes from many diffuse sources. Population growth resulting in rapid development is a primary threat to watersheds with an increase in impervious surfaces such as building roofs, sidewalks, and parking lots. Instead of stormwater slowly and naturally soaking into the ground and eventually filling streams and lakes, impenetrable surfaces cause water to rush too quickly back into the water bodies. 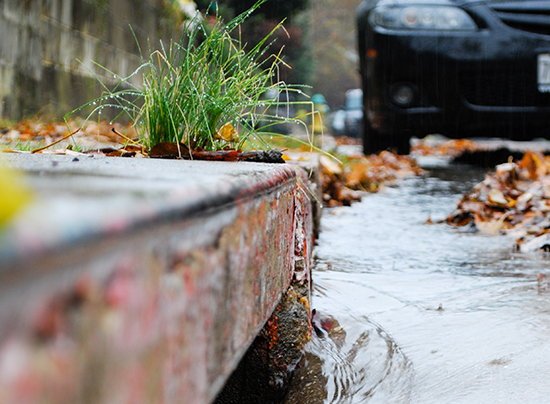 What are the impacts of stormwater runoff? Increase in pollutants washing into water bodies without being filtered through the ground. Stormwater picks up oil, dirt, harmful bacteria/ pathogens and pollutants and carries it into drains or directly into surface water. Flooding and erosion of stream banks occurs when a torrent of water rushes into the water bodies. This is caused by a lack of vegetation and an increase in impermeable surfaces. Runoff can pick up excess nutrients such as nitrogen and phosphorus from agriculture, causing increased vegetation. As a result, the decomposition process can reduce oxygen levels in the water- creating a deadly habitat for aquatic animals. Vegetation can be destroyed, therefore destroying aquatic habitat for wildlife. Increased sediment can also cloud the water, not allowing enough light for aquatic plants to grow properly. 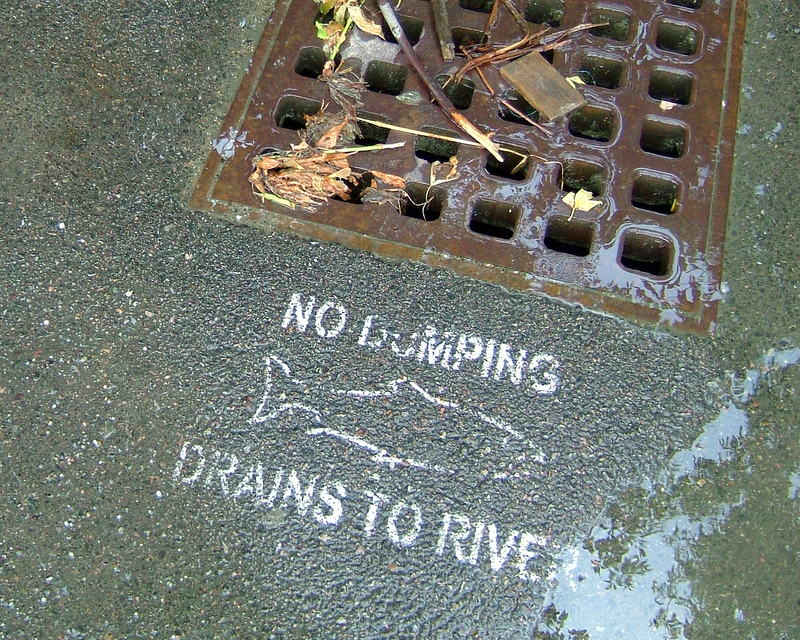 Runoff can carry large debris such as trash, especially plastic, which is harmful to fish and other aquatic animals. Thermal changes can take place when stormwater enters into water bodies. Impervious surfaces absorb and emit heat, so when water runs across it on a hot day, changes the temperature of the surface runoff. When the water reaches the rivers and streams, small changes in temperature can affect the aquatic plants and wildlife. Green roofs create a living landscape that would otherwise be occupied by roof area. They retain rainwater, allowing the plants to soak it up through the substrate or so that it can slowly evaporate or transpire back into the atmosphere. Rain barrels collect water from your roof through gutters and into mosquito-proof containers to be used for watering lawns/gardens. Retention/detention basins collect/store rainwater and slow runoff. They filter out large sediment and debris before being dispersed into stormwater drainage systems. Retention ponds have higher outflow point or drainage orifice, maintaining a permanent pool of water. Detention ponds have a lower orifice, allowing them to be completely dry or empty at times. Detention ponds are generally used to storm rainwater after a storm to prevent flooding. Permeable pavements/sidewalks can be made by a series of pavers, or with pervious concrete which captures water and allows it so slowly seep into the ground. Riparian zones/buffers are vegetated areas separating upland areas from aquatic habitat help control. The zones create a buffer between human activity and rivers/streams, slowing down runoff and protecting water quality (Riparian Buffers). They act as natural filters to reduce pollutants and sediments from entering a water body. Read more about them here. Nashville Adopt a Storm Drain!